From the very moment you find out you're pregnant, it's easy to let fears and worries creep into your mind. And honestly, it's pretty easy to be afraid even before you're pregnant (see Nine Reasons I'm Afraid to Have a Baby). From fearing the pain of miscarriage to worrying about all of the things that could possibly go wrong along the way, pregnancy is a strange journey of incredible excitement, anticipation, and underlying anxiety about what could happen. As the weeks tick by and I move closer and closer to my due date, old worries are fading away and new ones are replacing them. But lately, I've found peace in the midst of these concerns. 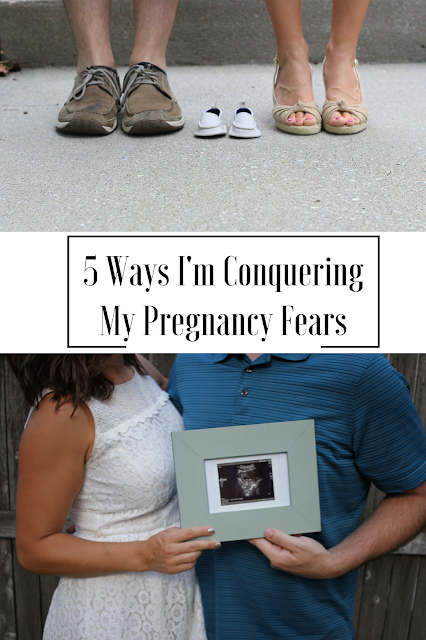 Here are five ways I'm conquering my pregnancy fears. In the moments where I'm most worried or fearful about all that is to come, I'm learning to remember the ultimate joy at the end of this journey: the blessing of raising our sweet child. I know that I won't necessary love things like the gestational diabetes test, getting an IV, or pushing through labor (literally), but I know that all of these things are necessary ends to a means. And if that ending places our beautiful baby in my arms, I know that everything will be oh so worth it. I won't care what I have to go through to get there: meeting Baby K, finding out their gender, naming them, and raising them up to love the Lord will be the sweetest, hardest, best journey ever. So it's all worth it. I looked in the mirror the other day at 9Round and found myself asking, "Can I do this? Can I really bring a child into the world?" And then I stopped and considered that I was 20 weeks pregnant, coaching softball, and still working out daily. And I thought, "Heck yeah, I can do this! I'm going to rock this!" Why is it that it's so easy to let ourselves be negative, but we're so slow to be positive and believe in ourselves? I'm finding that a positive mental attitude can quickly erase the fears that whisper to me randomly throughout the day. I'm choosing to believe that I can do this, just as so many women have before me, and so many will after me. I have been absolutely blown away by the incredible support of all the amazing mothers out there! From helpful advice on cribs and car seats to celebration of my pregnancy, moms have engulfed me with love and encouragement, and I am truly grateful. Of course, my family and mama friends have also been so wonderful, and I couldn't do this without them. But it has been oh so encouraging to see the love and support from so many who don't know me, yet are fabulous listening ears and encouragers! Y'all rock! Being willing to share our hearts and struggles together with vulnerability is a huge part of heart behind this blog's mission statement: to love fiercely, learn fearlessly, and live fully. I've found that holding in my fears only lets them eat away at me, making me into a monster who boils up and eventually spills over with emotion. So I'm choosing to be honest about my fears: with my husband, with my friends, and with those I love most. Even if it means waking my sweet hubby up in the middle of the night, crying about something random and seemingly unimportant, I'm doing it. Because I know that I need to be honest with myself and with others in order to work through these fears. A few weeks ago at church, while I was leading the song "It Is Well", I found myself moved almost to tears by these lyrics: "So let go my soul, and trust in Him. The waves and wind still know his name...And through it all, through it all, my eyes are on you. And it is well with me." In the moments when I find myself most worried or afraid about labor or motherhood, I stop and remember that God is good, that He is sovereign, and that His plans are to help me and not to harm me. So if there are complications or problems along the way with our baby, labor, or everything in between, I am finding myself saying, "It is well, Lord." I know that His plans may not always be what I want, but they are what I need. And I find hope and peace in knowing that ultimately He has brought us to this place, given us this child, and provided us with more than we could ever dream of. So I know He is good, and that I am not in control, which is so freeing. The journey from being afraid to have a baby to knowing I was ready for one was definitely filled with tears, joy, and the realization that my fears were not enough to keep me from yearning for a child. But along the way, God has always been good. I know that there may still be times when I freak out about labor or worry about things to come that are unknown, uncertain, and scary. But in the end, I trust that I am equipped to be a mother, that I have been chosen to have this particular baby at this particular time for a reason, and that God will not let me fall. I'm so grateful for the amazing support system that I have, for mama friends to be vulnerable with, and for the opportunity to bring our sweet child into this world oh so soon. I'm leaving you with some of my favorite powerful and encouraging songs. I hope that their truth and peace will calm your soul and mind just as they have for me (and not just for pregnancy fears). Be sure to check out some of my other posts on motherhood too, and shoot me a message if you'd like to chat more about pregnancy, fears, or really anything! Pregnancy is hard, and so much of that is a mental thing. I'm so happy to see people admit to being fearful. The whole concept is pretty intimidating- who wouldn't be afraid of it? You're already doing a great job, Mama! Definitely, it's very mental. Thanks so much for all of your encouragement!! I'm so glad to hear that, Sarah Jean! It is scary for sure, but God is so good and he really helps lead us through all of this. If you have questions or want to talk, I'm happy to! It's so important to have ways to cope with our fears especially during pregnancy. I remember having fears about miscarriage and our baby's health and I would tell my husband and he would just say that's not gonna happen. It drove me crazy! How does he know that! I had to tell him that what i needed to hear was that even if it does happen, we'll be OK, not denial that it could happen. Our little girl ended up having hypothyroidism and while it means lots of doctors visits and daily medicine, we are OK! Yes, yes, yes!! I think I can relate to everything you're saying. It's awesome that you can still see the positive in your situation, and that you still have an amazing baby girl! First of all, congratulations! I'm glad you're addressing fears women have being pregnant. A lot of my friends were quiet during their first pregnancy because they didn't want to seem like they weren't strong, but it's not even about that. Thank you so much! I agree, we don't have to just put on a good face! Thanks so much, Abbey! He is definitely so good and in control- which is so comforting for all us mamas! I absolutely lovelovelove this, Kelsie. I can't imagine how terrified I would/will be when that time comes for us, and I'm SURE I'll be freaking out all the time about "not being ready" or "not being qualified." That positive mindset and believing in yourself must be SO important. Thank you Erica!! It is definitely a battle every now and then, but I find that being positive makes a HUGE difference! I know exactly what you mean!! Husbands are the best, and it's totally normal to feel these things. Thanks for reading! Thank you so much for this post. I am just pregnant and this helped me a lot! That is so great to hear! Thanks for reading. If you have any questions or anything, I'm happy to help! Thank you. Really. Thank you for this. I am still at the terrified to get pregnant stage and my husband is starting to want a baby. It's been a source of stress between us recently. It's really encouraging to see that you've made it past that and gives me hope that I can too. Oh my goodness, I'm SO happy to help! I'm definitely seeing how I've moving through each of these stages, with the help of God and a good support system. I know what you mean about the stress for sure. You can make it through! I'm happy to chat if you ever want to ask questions or reach out! There are so many thoughts that goes through our mind when we are pregnant that it can sometimes be overwhelming. You have great tips and I totally agree with you, always stay positive and keep in mind the big picture. Trust in God and you will be fine. I can honestly tell you that once you're in labor, your fears will disappear and your excitement to finally meet your bundle of joy will definitely be in high gear. Congratulations and best of luck! Oh for sure!! It's so great to hear that the other things will fade away when I'm getting ready to meet our sweet baby. Thanks SO much for your encouragement. first off congratulations on the baby!! I am pregnant with my third child and still go through pregnancy fears. I love the tips that you give! Thank you so much for reading and for your congrats! It's good to hear that these are normal and don't go away with one baby either. Thanks! Wow, what a sweet post! Congrats on the baby! I am not pregnant yet and have no children but I can still relate to this. I am always worried about the unknown. Pregnancy scares the crap out of me. But using all the tips above will help me calm down, I think. Thanks for sharing! Thank you! It is scary, but there are so many truths that make it more manageable along the way. Thanks for reading! Pregnancy is easily the most anxious experience ever, and I've done it multiple times. It does get a little easier each time, but it's never totally anxiety free for me. It's just such a miraculous occurrence, the way an entire person explodes into being inside your body...it just defies logic and of course there is SO much to be nervous about!! I am so glad you have decided to be positive in this experience, it really is all you can do. So excited to finally see that baby! Im down to less than a month left! Yes, amen to all of that! Congrats on your upcoming arrival! I love your transparency and how important it is for you to just be honest with your fears. I was actually thinking the other day how terrifying pregnancy will be. 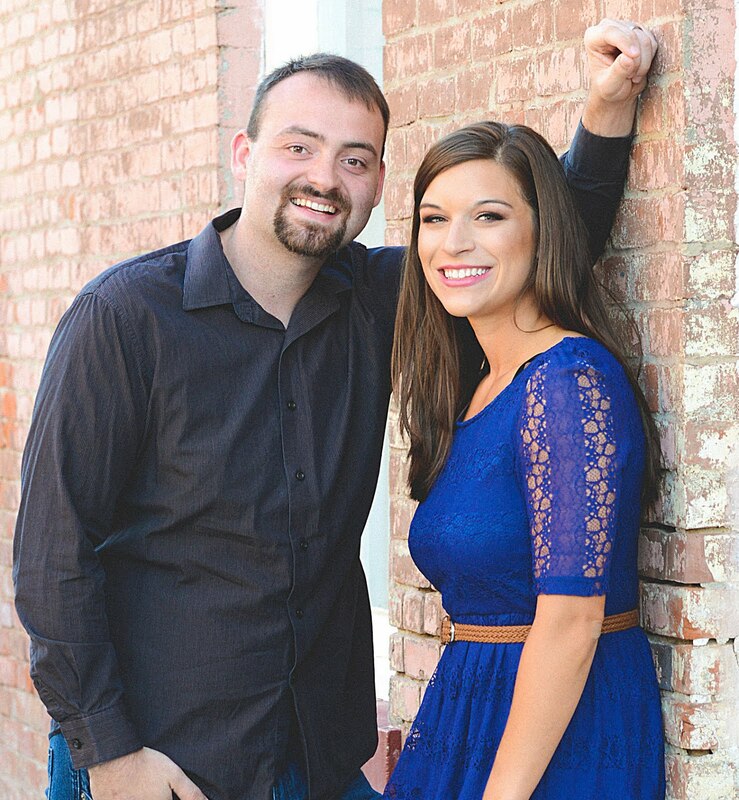 As the time comes closer (we would love to possibly start trying next year immediately after we marry), I find myself thinking about all of the scary things that parenting brings. What if I'm driving my baby to the doctor's office and we get in a car wreck? What if I have a miscarriage? What about creepy child predators when my child is old enough to be on the internet? It's so easy to think "What if," But we need to ultimately trust the greater plan and know that we can only do the best we can do. Praying for you throughout your journey, lady! Thank you so much, Chelsea! I think that has been a huge part of it for me- being honest and real about it all. There are SOOOOO many things in life to think and worry about with parenting, but we can't live life scared all the time, right? We've got to trust, like you say! Thanks for reading and for the prayers!! I had so many fears when I was pregnant with my first. It gets easier! I wasn't near as afraid with my second. Having a great support system helps calm fears too. That's so great to hear! I agree, the support system is HUGE. Thanks for reading! !